I saw an FN FAL (Wiki)at the Aldershot military show (Wiki) in England and they allowed civilians to fire it using a 22 sub caliber adapter. It took many years to find that H&K made the adapter and get one. This is classified as a battle rifle because it uses rifle ammunition, not a sub machine gun (Wiki) which uses pistol ammunition (Wiki) and not an assault rifle (Wiki) which uses ammunition in between pistol and rifle cartridges. It's not a machine gun (Wiki) because it's not specified for continuous use. The M14 (Wiki) is a battle rifle. Years ago I had a Sig PE57 which was the civilian (semi auto (Wiki) only) version of the SIG SG510 (Wiki). Miniguns (Wiki) are motorized Gatling guns (Wiki) that were used on Gunships (Wiki) and Gun Trucks (Wiki). The rifle markings: ".308 Match", "Fabrique Nationale D'Armes De Guerre-Herstal-Belgique", "Browning Arms Co, Morgan, Utah". The scope markings: "Hensoldt Wetzlar" (Wiki: Carl Zeiss)), "12-120-9556", "BMVtdg 30", "Made in Germany"
This is really a separate topic, but for now I'll park it here. When shooting at a range of 1,000 yards (about the same as 1,000 meters) or more there are a number of corrections to the aiming point that need to be made. The key idea is that the "Ballistic coefficient" (BC) (Wiki) was developed in antiquity and has a problem at some bullet Mach numbers. It turns out that the Coriolis Effect (Wiki) is very important at 1000 yards (more important than some of the more common ideas). The Eötvös effect (Wiki) may also be important (don't remember it being in the book). Both of these are because the Earth is rotating. For example where a bullet goes depends on the azimuth the gun is pointing. Pejsa points out that the stability of a projectile is improved if the center of gravity (Cg) is at the same location as the center of pressure (Cp). When these are at different locations the projectile is less stable. Is there a commercial .308 round where these are at the same location? Let me know. From the gyroscopic discussion below I would expect that if the Cp was far behind the Cg, like an arrow, that would lead to higher stability. While learning about gyroscopes I read (Gyroscope Reference 3, 1913) that (1) the purpose of rifling in a gun barrel is to slow down the bullet so the powder has more time to burn and develop higher pressure and that (2) at long ranges the spinning of the bullet makes it less accurate. The second effect comes about because the bullet is gyroscopically stabilized and it's centerline stays parallel to the centerline of the barrel throughout the trajectory. That means that as soon as the trajectory bends the bullet is no longer pointing along it's path but instead pointing to one side. The larger the angle difference between the barrel centerline and the trajectory the more the bullet is pointing the wrong way. Note that an arrow is aerodynamically steered so that it always points in the direction of travel. If a bullet was made like an arrow with a tail that could keep it pointing forward it would be much more stable (accurate). Note the gyroscope book reference 3 is about 100 years after the below papers on Gunnery and Rifled Barrels. The Mk44 Bushmaster II (Wiki, Alliant Techsystems) is demonstrated on Future Weapons Season 3 (NetFlix streaming video). The interesting thing is that after using a laser range finder to determine the distance to the target then programming the shell to explode either just prior to the target, at the target or after going some distance behind the target. This is similar to the capability of the 25mm grenade rounds that are being developed. The Mk44 does this by measuring the Earth's magnetic filed and using that to count the rotation of the round. Patent 5497704 Multifunctional magnetic fuse explains how it works. Note the fuse includes an impact sensor, time delay, turn counting, magnetic (proximity) sensor . After the programmed number of turns the shell explodes. The muzzle velocity is about 1,000 meters/second so for 1 meter stability the rifling pitch is about 1 turn per meter. The CheyTac Intervention (Wiki, ) fires the .408 Chey Tac (Wiki) round which includes the patented (patent 6629669) Balanced-flight controlled-spin projectile concept. The outline of the .408 is very similar to the Barrett .416 (Wiki) (I wonder if Barrett copied the .408 but made it a little different?). The Barrett Optical Ranging System (BORS) is based on the old fashioned BC idea and includes left-right tilt which Pejsa has shown to be a faulty idea. Accuracy International (Wiki) makes sniper rifles in various calibers but not the .408 or .416. 7676137 Optical sight, Darin W. Schick, Newton Quan-Chung Kwan, Timothy H. Miller, Jerry Glen S. Elpedes, Trijicon, Inc., Mar 9, 2010, 385/147, 385/134, 42/111, 33/298, 42/132, 33/297 - has provision for digital data in field of view. - What is model number of just scope with data display? New Principles of Gunnery 1805 (Free Google Book) has papers from the prior 50 years. The first 380 pages are about interior and exterior ballistics of round projectiles fried from black powder guns (3/4" lead balls and 24 pound iron balls). In those pages he shows that air resistance greatly reduces the range you would get in a vacuum and so the trajectory is far from parabolic. I expect this is also true of dumb bombs, that's to say the trajectory is far from parabolic. that by the same boring motion it made its way much easier through all solid substances, and penetrated much deeper into them, than if discharged in the common manner. The projectile was a round lead ball, either forced into and down the barrel where the lead deformed to match the barrel or in a leather patch where the lead was not deformed. The latter had much higher muzzle velocity because there was much lower friction, but still for the same powder charge used with the smooth bore the velocity was lower than a smooth bore. But, he also says "And in the first place I must observe, that though the bullet impelled' from them keeps for a time to its regular track with sufficient nicety; yet; if its flight be so far extended, that its track is much incurvated, it will then of ten undergo considerable deflections. This, according to my experiments, arises from the angle at last made by the axis, on which the bullet turns, and the direction in which it flies; for that axis continuing nearly parallel to itself, it must necessarily diverge front the line of the flight of the bullet; when that line is bent from its Original direction; and when it once happens; that the bullet whirls on an axis, which no longer coincides with the line of its flight; then the unequal resistance described in the former papers will take place, and the deflecting' power hence arising will perpetually increase, as the track of the bullet, by having its range extended, becomes more and more incurvated." Note in none of the above arguments (both European & English) is improved accuracy a benefit of rifling. In the case of the English analysis it helps accuracy at short ranges by averaging imperfections in the ball but at longer ranges causes a lot of problems (because of gyroscopic action). But he didn't do any experiments relating to the amount of powder that's useful in rifled barrels. Remember with black powder that once the bullet leaves the muzzle any unburned powder is pushed out and will fall on the ground (easy to detect if a white bed sheet is on the ground). I expect that you can use more power to useful effect in a rifled barrel, confirming the first bullet above leading to higher muzzle velocity. Wiki: Miller twist rule - supposed to me more accurate than the Greenhill formula. Note Pascal-B was the second underground nuclear test where the ground level cover (a 4' diameter 4" thick steel plate (about 1 ton weight) was blown off at about "Six times the escape velocity from the earth." This was caused by many tons of concrete that were vaporized by the explosion that went up the shaft and propelled the cover. The cover vaporized like a meteor. 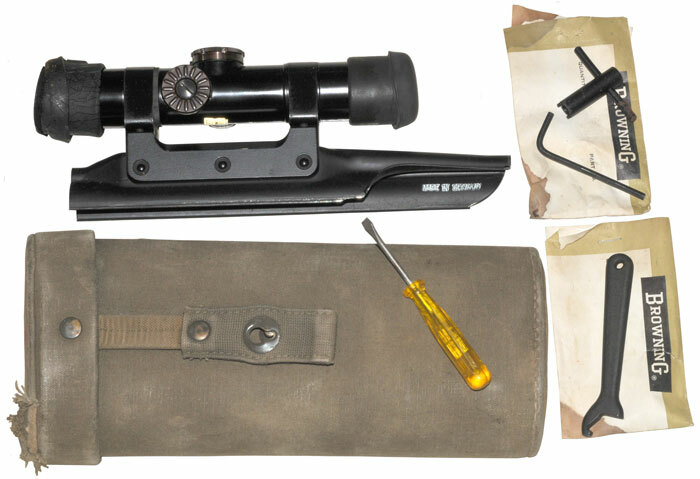 eBay seller outdoorzone described as: "11.5" 2-Piece FN FAL .308 Rifle Weaver/Picatinny Aluminum Mount Accessory System"
There are a number of flashlights designed for rail mounting. In order to use your favorite exterior ballistics method you first need to know a number of things including the range to the target. Most sporting telescopic sights do not include any rangefinder features and it's left to the spotter to determine range. 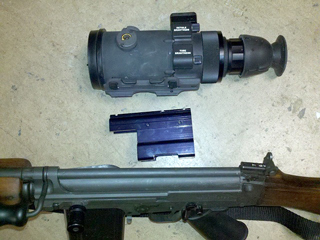 Most military telescopic sights include some form of ranging based on the method of stadia. There are many types of Range Finders, a popular one is the laser range finder, but the good ones are expensive and can give away the shooter's position. The Wiki page for angular mil really does not make it clear how it works. The idea is that for very small angles the value of the sine of an angle (Wiki) is the same as the angle if the angle is expressed in radians (Wiki). This comes about because of the Taylor expansion (Wiki) for the sine function. So, if we say an angle is very small if it's 1/1000 of a circle. So there are 1000 * 2 * PI milli radians in a circle (6283.185307....). 360 degrees / (2000* PI) = 0.057296... deg. SIN(0.057296... deg) = 0.0010000000 That's a perfect ratio of 1 to 1000. So... if you have two marks on a telescopic sight that are separated by 1 milli radian an object that's 1 yard tall will perfectly fit between the marks at a range of 1,000 yards. If the object is 8" tall and fits a 1 milli radian angle it's range is 8,000 inches or 666.66 feet or 222.22 yards. Note: Minute of Angle (MOA) (Wiki) is a different thing. A rule of thumb is that 1" at 100 Yards is a MOA. Note: 100 Yards = 300 feet = 3600 inches. Since a minute of angle is 1/60 of a degree and SIN(1/60) = 0.000291, and 3600" * SIN(1/60) = 1.047" the rule of thumb is close enough. This is also a very small angle but is different than an angular mill which would be 3.6" at 100 yards. MOA is typically used to express the accuracy of a rifle whereas angular mils are used for range finding or aiming artillery. In the Wiki page for this kit there's an image showing a number of accessories and their name & NSN. This is really about a variety of optical sights. M26 Modular Accessory Shotgun System (MASS) (Wiki) - Option instead of the M203 or M320 - 5 shot pump 12 ga shotgun. Probably based on the C-More Systems CMC-M1 straight pull 12ga clip feed shotgun. corrects many of the problems with the red dot sight. To test for parallax move eye left <-> right and see if reticle stays fixed relative to target. Surveyors do this as part of the procedure of adjusting the eyepiece focus on the reticle. Reflector (Reflex) Sight (Wiki). The heads up display (Wiki) is based on the reflex sight developed in W.W.II., now thery are in cars (Wiki). PS a big problem with the original Red Dot was that the small coin cell battery would be quickly drained if you forgot to turn it off. Collimator sight (Wiki) - the cross hairs appear to be at infinity, common on mortars and filed guns. (Wiki: ACOG) and combines reflex and collimator sights. Holographic Sight (Wiki) - uses a laser diode to illuminate a hologram in a reflex sight type housing. Add On Optics - Note that the light coming into the front of all the above sights is collimated (Wiki) and so an optical accessory can be placed on the Picatinny rail (Wiki) and if it's output is also collimated will work with the sight. For example a night vision adapter. In a similar fashion an optical device can be placed behind sights that have collimated outputs, like the reflex and collimator sights. For example a low power telescope. Note for this type of add-on optic to work the output optical centerline of the front device needs to be the same as the input optical centerline of the rear device. This might happen because the manufacturer of both devices made them to work together or because a height adapter is used (just an idea). So in these cases the Picatinny rail is working as an Optical Bench (Wiki). Forgotten Weapons: High Standard 10B: Disassembly and Attempted Shooting - loose pin in trigger group caused malfunction. The FN FAL with the K&K 22 sub caliber adapter above is my most interesting 22 gun. There were different versions that utilized .22 Hornet or 22LR on the top barrel and .45 Colt/.410 shotgun on the bottom barrel. Marlin Model 60 tubular magazine semi auto - maybe the most popular 22 rifle made prior to the Ruger 10/22. Ruger SR22 Pistol -I like the prior Mk IV semi auto pistol that has a long history of plinking fun. CZ 452 bolt action - they mention the "Trainer" as having the look and feel of a 308 rifle. GSG STG-44 a 22 rifle with the look and feel of the MP-44. fires only 22LR High Velocity ammo. Winchester 1890 led to the Winchester 62 (Wiki) - called Gallery Guns (Wiki) because of their use in shooting galleries firing 22 short or CB cap ammo. I remember shooting these at the Santa Cruz beach boardwalk. Browning SA-22 Take Down (Wiki) - tubular magazine semi auto load magazine through port in stock. My uncle had one of these and it had a very nice feel. page created 7 July 2010.